KAMPALA – Rajiv Ruparelia, son to city business mogul Sudhir Ruparelia, has put the dfcu bank on notice for publishing and exposing his private telephone contacts as the two entities fall out in the aftermath of sale of Crane Bank continues. In an October 8 notice by his lawyers, Walusimbi and Co. Advocates, Mr Ravij protested what he called breach of confidentiality by the dfcu bank for exposing his private and confidential information obtained by virtue of being his bankers. “Our client begrudges this breach of confidence actionable both civilly and criminally, and accordingly requires an immediate formal apology similarly shared on all platforms hitherto published together with atonement for the same not later than close of business this week,” Mr Rajiv’s lawyers wrote to dfcu bank secretary. dfcu last week through her lawyers, Kalenge, Bwanika, Sawa and Co. 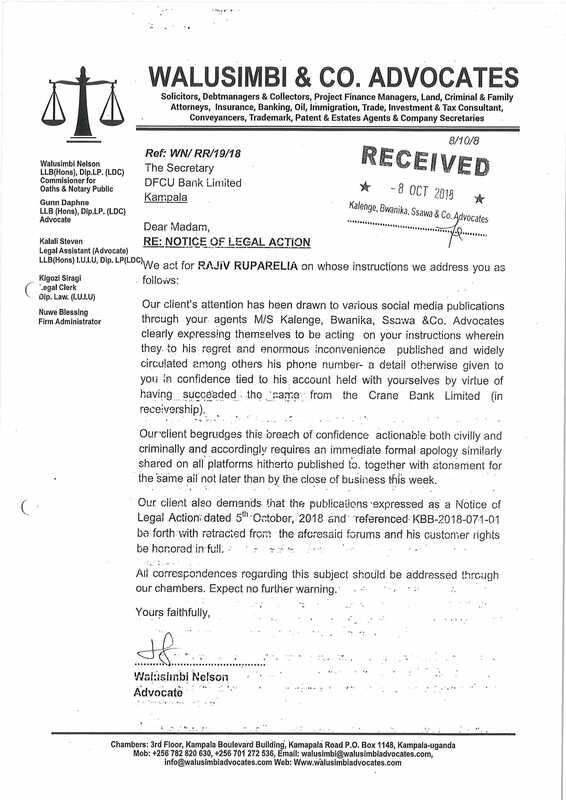 Advocates (KBS) drafted a notice threatening to sue Mr. Rajiv and several online newspapers for maligning its name. “You have done this repeatedly and to a very large number of recipients with a view to driving traffic to the false stories…” read the notice dated October 5, 2018. But Mr Rajiv is having none of this as the fall out from the takeover of Crane Bank deepens. “Our client demands that the publications expressed as Notice of Legal Action dated 5th October 2018 and be forthwith retracted from the aforesaid forums and his customer rights be honoured in full”. dfcu has suffered investor trouble and has been a subject of public scrutiny ever since the takeover of Crane Bank. One of its directors, Mr Deepak Malik of Arise Holdings resigned from the dfcu board three months ago in the aftermath of pulling out of the bank by the Commonwealth Development Corporation (CDC), Britain’s oldest development finance institution. Arise Holdings has 58 percent shares while CDC is DFCU’s oldest investor after jointly setting up the bank with the Government of Uganda in 1964. CDC’s move comes in the aftermath of the fall out from her partner’s takeover of Crane Bank with the transaction attracting industry scrutiny over transparency issues and it’s European shareholders in the spotlight. The Auditor General has since issued a damning report against the transaction flagging it nontransparent.